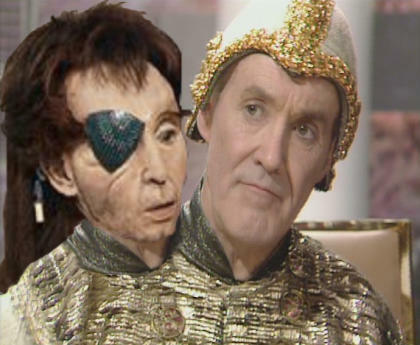 Lord President Borusa of Gallifrey has been found to possess two heads. The shock discovery was made by a Capitol Guard, as his lordness was accused of driving a TARDIS dangerously. 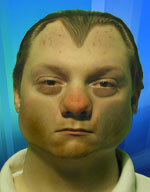 When pulled over, Borusa refused a breath test and his secondary head told Commander Maxil to "Piss Off". Hot headed Maxil took offence to this and blew the head off the Lord President's shoulders, and then proceeded to spit down his neck. Borusa is said to be very broken up and in two minds about the situation. The Castellan has ordered an investigation into the subsequent accidental death of Commander Maxil, who was standing in the docking bay when an experimental TARDIS, disguised as an ACME safe, crashed on top of him. No connection has been made between the two events - until now. Roland: "So you wanted another head? Was it to impress the Time Ladies?" L.P.: "I deny everything, I have only one head - it's not true - MUMMY!" Roland: "And that bulge in your robes, Mr. President?" L.P.: "We'll, erm, I'm happy! I'm about to give an intern a box of cigars..."
Roland: "A likely story - it's not like you Time Lords to splash out on a lady. Readers of the News of the Universes want the truth - what's that bulge hidden on your shoulder?" L.P.: "It's the bulge of Rassilion! Yes, that's what it is." Roland: "What does it do, besides sneeze as it just did?" L.P. "Oh, alright. It, er, cheers me up and talks to me. It's very lonely being the President of Gallifrey, you know. I don't have a large staff, no - all I get is the Castellan and his weekly 'Oh, no, not the mind probe!' crap! My bulge keeps me in contact with the needs of another man." Roland: "Yes... does this bulge come in the shape of a head?" L.P.: "No! Now I must attend to my business. Goodbye." Timelord democracy requires a High Council majority to confirm any major decision. We believe that Borusa is attempting to gain complete control of the Council by building a collection of heads that will be counted, and allow him to buldoze through, every vote.